Patriot Gold Corp., a developing gold and silver exploration and production company, today announced positive assay results of the first and second drill holes (B-1301 and B-1302) from the 2013 drilling program at the Penelas East target area at the Bruner Gold project located in Nye County, Nevada. Spring drilling project is underway with two out of 12 scheduled drills completed. An additional 16 scheduled drills are scheduled to be completed in the northwest region of the Bruner project site during 2013. "We are very excited to report these first assay results which notably include the second best intercept we have seen from drilling to date for the Bruner Gold Project," said Karl Boltz, Vice President of Business Development for Patriot Gold. "Drilling on this relatively new discovery deposit to the east of the historic producing mines has encountered another long interval of good gold mineralization, and we look forward to keeping our shareholders updated as the Spring 2013 twelve- hole drill program advances in the Penelas East target area." The second best intercept drilled on the Bruner property was encountered in drill hole B-1301 which intersected 91.4 meters of 3.1 grams per tonne ("g/t") Au (300 feet grading 0.090 ounces per ton ("opt") gold) between 290-590 feet. This long intercept of mineralization included 5 feet grading 117 g/t Au (3.402 opt) and 396 g/t Ag (11.55 opt) between 415-420 feet. The intercept is located approximately 55 meters (180 feet) south of the discovery hole B-1201 reported last year which contained 110 meters of 4.08 g/t Au (360 feet grading 0.119 opt) between 290-650 feet. In addition, drill hole B-1301 intersected two thinner and lower grade zones further down the hole at 660-695 feet depth, including 35 feet grading 1.507 g/t Au (0.044 opt) and between 750-780 feet downhole, 30 feet grading 0.474 g/t Au (0.014 opt). 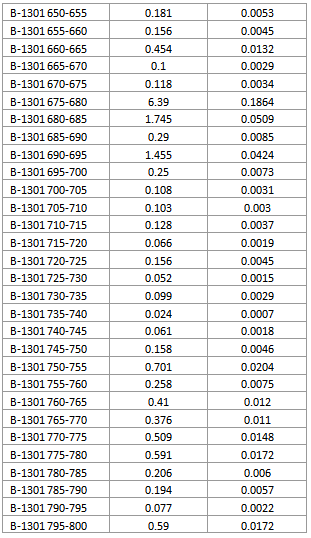 In comparison, drill holes B-1301 and B-1201 have very similar characteristics with a high-grade core close to centered within an extensive and robust lower grade halo surrounding the high-grade core. More importantly, drill hole B-1301 is on the southern end of the drilling pattern completed to date at the Penelas East target area, indicating that the wide zone of mineralization with a central high-grade core remains open to the south. Mineralization at this depth could be accessible by open pit. Drill hole B-1302 (N95E azimuth and -75 degree inclination) was designed to intersect the mineralized zone 60 meters (200 feet) below that in B-1301 (N95E azimuth and -60 degree inclination) and intersected 16.8 meters (55 feet) grading 1.563 g/t Au (0.046 opt) from 640-695 feet downhole. It has not yet been determined whether this intercept is the down-dip equivalent of the thicker high-grade zone encountered in B-1301 or whether the target dips to the east and, thus, out of reach of drill hole B-1302. The drill intercepts are summarized in the following table with the complete table of results included at the end of this release. As part of the drill program, all intercepts greater than 3 g/t Au (0.09 opt) are being re-assayed from a one kilogram split from the coarse rejects and pulverized entirely to -200 mesh to assess the presence of particulate gold in the higher grade intercepts. For the first half of 2013, a total of twelve holes are planned for the drill program at the Penelas East target area to obtain a better understanding of the geometry and orientation of the mineralized zone given that the area is not exposed at the surface. Results from these holes will be announced as they are received and analyzed and are expected to be released on a section-by-section basis going forward. 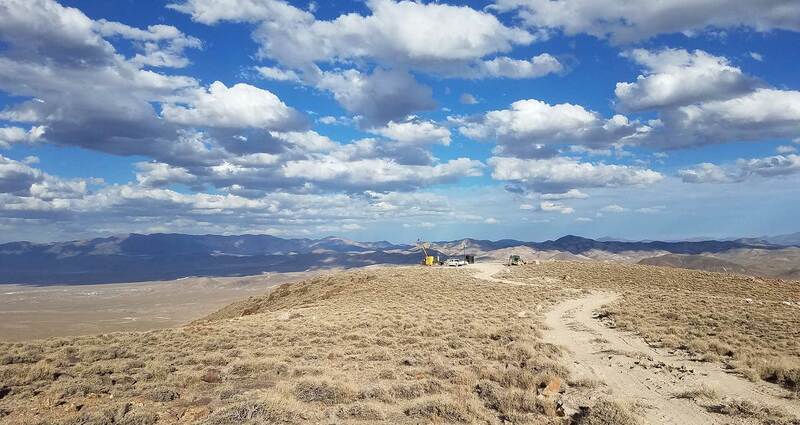 The Bruner Project is situated in central Nevada, 15 miles north of the Paradise Peak mine, 45 miles northwest of Round Mountain and 25 miles east of the Rawhide mine. Historic production from the Bruner property included about 100,000 ounces at an average grade of 0.56 opt gold. Since commencing drilling with its current earn-in optionee/operator in November 2011, the project has completed 19 drill holes through reverse circulation techniques and three core holes. Currently, ten more holes are planned for the East Penelas target area in the first half of 2013, and an additional 16 drill holes are planned in 2013 for the northwest portion of the Bruner Project to test the northern extension of the historic producing areas. Patriot Gold owns 100% undivided rights, title and interest in the project which is subject to certain royalties and an earn-in option agreement for 70% interest. The earn-in optionee/operator has the right to earn 70% interest in the Bruner project by spending $6 million over seven years and may earn an additional 5% by completing a bankable feasibility study for a total of 75% interest in the project. Subsequent to the optionee/operator earn-in, financing of the project will be on a proportional basis.